Buy Common Juniper Tree online FREE DELIVERY and FREE 3 YEAR WARRANTY. A small native, British evergreen tree, Juniper (Juniperus communis) will reach a final height of 6-10m after 20+ years and may form into a low spreading shape (a bit like most middle aged men!). Expect a spread of 2.5 to 4m. Its prickly, thorny foliage has a scent of apples when crushed. Identifiable by its small silver backed needles, prickly to touch, which are arranged in whorls of 3. Its berries are used to flavour gin although technically they are not berries but cones and are appealing to birds. Expect the bush to produce berries from 2 years onwards but can take as long as 8. Protection from sheep, deer, rodent and bird damage is recommended e.g. 60cm tree shelters. 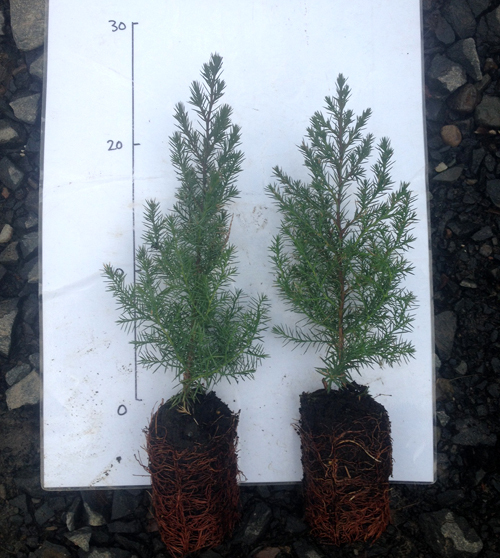 Previous Forestry Commission plantings at Moray using these shelters improved growth rates by almost 100% (4cm to 7.5) and changed their form to a more upright shape. Grows well on a wide range of well draining soils (will tolerate drought) and extremes of temperature although we draw the line at International Space Station window boxes. Best results come from low Nitrogen soils which are usually found in low or high PH soils. The berries are green when young and mature to a purple black colour which can take 18 months depending on local conditions. Requires very little if any pruning and does particularly well in hot sunny sites. They can live up to 170 years so that is a lot of "not pruning". One of the outstanding features of Common Juniper (Juniperus communis) is that it is a bit like sand on a picnic, found everywhere. It has the largest geographic range of any woody plant on the planet, found from Alaska to Mexico. Low hanging branches covered in soil can develop their own roots. During the colder times of year, you may get some Juniper plants that are a little brown. This is a reaction to the cold and is perfectly normal. As these are grown in trays and the inner plants are protected somewhat from the cold and do not turn brown so in essence, the brown trees are normal, it is actually the green foliage that is not performing as expected! As through out most of nature, the male trees are all show and only produce flowers. It is the female plant that goes through the bearing berry stage and never lets the male plants forget how much pain they went through doing so. Apparently the amount of pain tolerated by the female in berry bearing would kill the average male plant but then our information comes from a female plant so we suspect the viewpoint expressed may be jaded and not unbiased. A pack of Juniper trees should produce on average 80% that are female and berry bearing. All the saplings are grown from seed supplied by multiple trees in the Highlands therefore increasing genetic diversity. It also means if you hear lines being shouted from the film Braveheart from your garden, that these Juniper trees may be responsible for that. As usual, local conditions affect your waiting time. We have customers in the Midlands saying it took 6 years from time of purchase for ripe berries to be produced. From that we would say those in the South may have slightly less of a wait and those in the North maybe slightly longer. Typically, Juniper is planted in groups of between 10 and 25 trees along the woodland edge. This number of trees is ideal for creating a wildlife habitat and a meaningful source of food and shelter. Spacing may vary between 1m (3ft 4in) and 5m (16ft 8in). The aim is to mimic what nature intended and thus avoid artificial lines. Blending of one species into another is suggested although bearing in mind different growth rates. Aspen is a minor native tree species and along with the many other native, British tree and shrub species we sell will form part of an attractive native woodland.